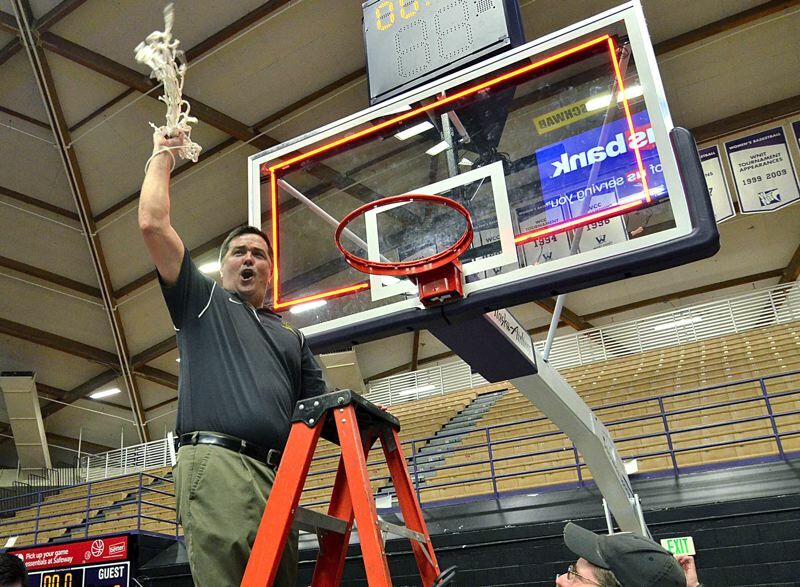 The West Linn boys basketball team hired a new head coach on Tuesday. On Tuesday, West Linn announced that Eric Viuhkola — who led the program from 2008-09 through 2015-16 and closed his tenure with four straight Class 6A state championships — would return to the program for the upcoming 2019-20 season. "The big reason I came back is that I love to coach and West Linn is the only place I would coach, at least while my kids were in school." To suggest that Viuhkola has had some previous success making West Linn teams "the best that they can be," would be a massive understatement. During his earlier eight-year run with the Lions, Viuhkola led the Lions to three Three Rivers League titles and a 76-21 TRL record, along with six straight state tournament berths, a 166-55 overall record and Class 6A state crowns in 2013-16. Viuhkola succeeds Tyler Toney — he assisted Viuhkola for five seasons — after Toney served three years at the Lions' helm. Toney led West Linn to one TRL title, went 31-9 in the Three Rivers League and 52-28 overall, winning the TRL crown and finishing third at state in 2017, taking second in the TRL in 2018 and losing in the second round of the playoffs, then falling to fifth in the TRL in a 2019 season ravaged by injuries and player defections. Viuhkola — who remains close friends with Toney — complimented the job Toney did in his three seasons, a stretch that included the following: 2016-17 began with a hailstorm of criticism when the West Linn program was bolstered by a number of high-profile transfers; the Lions started fresh again in 2017-18 after graduating five senior starters from the year before, competed well, but failed to reach the state tournament for the first time since 2010; and in 2018-19, the team went through a whirlwind of injuries and defections and ended in the second round of the playoffs. "Tyler and I are really good friends. … I kind of think of him as my little brother," Viuhkola said. "He did a lot of good things, but this past year … I think he was at a point where you go 'Hey. For the five cents an hour you make, it's a real stressful job and I need to spend time with my own family.'" Viuhkola, who left the program to ensure that he'd be able to see his own children — daughter Vanessa is a junior and son Zeke is a freshman — grow and play, said they were his first thought when he was approached about coaching again. "West Linn was the only place that I would go to because of my kids, at least until they got out of high school," Viuhkola said. "So I thought 'Hey. I'd like to get back into it' and the opportunity arose and I went for it." Viuhkola inherits a team that went just 6-6 in league and 12-14 overall before being eliminated in the second round of the state playoffs in 2019. But that same team graduates just one senior and returns a bundle of proven varsity players, including top scorers Micah Garrett and Bryson Crockett. "I know that we've got a lot of good players. I watched them play a number of times," Viuhkola said. "There's a lot of talent there. Anytime you go in to start a program, you like to start with that and we've got a bunch of kids with a lot of skill and a lot of athletic ability. "I think we've got a pretty good young core, a pretty good mix. We've got some kids who are going be seniors and some younger kids who can kind of build the program up." And that is exactly what Viuhkola plans to do — do the hard work of building the program up again. "A successful season doesn't only mean a state championship — to me, it means that at the end of the year, we got as close to our potential as we could," Viuhkola said. "To me, that's all you can ask. If you get as close to your potential as you can, you can look the mirror and go 'It was a success.'"